The breed was developed in the early 19th century for the sole purpose to fetch game that had been shot down. It was bred from the Lesser Newfoundland and developed into a land and water retriever. It was trained to flush game from brush and to hunt in upland areas. After the WWII, their numbers fell drastically. In the 1960's, the breed was reestablished but the numbers remained low. 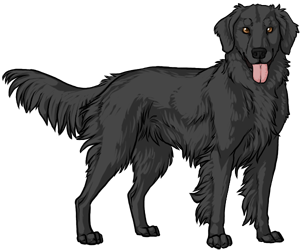 The Flat-coated Retriever is known for a tail that's always wagging! Admitted to the AKC in 1915. The Flatcoat's most famous patron was H. R. Cooke, who for over 70 years kept the breed in his fabulous "Riverside" kennel.